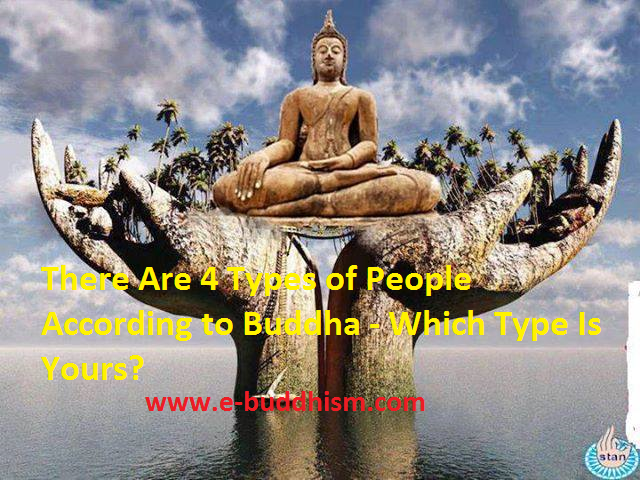 There Are 4 Types of People According to Buddha - Which Type Is Yours? Home » Buddhism » mind » positive life » There Are 4 Types of People According to Buddha - Which Type Is Yours? The Buddha did not speak in riddles. His teaching is clear and well-explained. Svākkhāto bhagavatā dhammo. Whenever he said something that people might not understand properly, he explained it immediately. What is darkness? What is brightness? How does one keep on running from one to the other? “I am suffering because of this person, because of this incident, because of this cause.” One generates aversion towards that person or cause. This misery is the result of past kammas of aversion, and now, one is planting more seeds of aversion. There is already so much darkness in one’s life and one is planting more seeds of darkness. These seeds of anger, hatred, ill will bring nothing but misery in the future. So the future will also be full of misery. The present is misery, the future is misery. The present is darkness, the future is darkness. So such a person is running from darkness to darkness. There is brightness all around in one’s life. There is happiness today because of material wealth, good health and prestige in society. But there is no wisdom within. So one becomes arrogant because of all this wealth, power and status and feels contempt for others. Because of some good kammas of the past, there is brightness all around. Sooner or later, this will come to an end. But every moment, one is planting seeds of egotism, seeds of aversion, seeds of misery, seeds of darkness. These seeds of negativity will result in darkness in the future, misery in the future. Thus this person is running from brightness towards darkness. The third type of person is in exactly the same position as the one in the first group. There is hardship all around, darkness all around in the present but there is wisdom inside. One keeps on smiling. So one generates only love and compassion towards such people. One is planting seeds of love, of compassion. Now there is darkness, but the future is full of brightness. Sooner or later this darkness will go and then there will be only brightness. One is planting seeds of brightness, which will bring brightness in the future, happiness in the future. So one generates love, compassion, and goodwill all the time. All actions—vocal, physical, and mental—are for the good of others. One plants seeds of brightness. From happiness one is running towards happiness; from brightness, one is running towards brightness. We should not be like the people in the first or the second group. We must be like the people in the third or the fourth group. Whether third or fourth, this is not in our control. Sometimes, life may be full of darkness, full of suffering because of the past kammas. At other times, life may be full of brightness because of the past kammas. There is happiness or unhappiness in life because of the results of past good and bad kammas. Irrespective of whether there is happiness or sorrow, brightness or darkness, we will develop brightness within. We will not make any new saṅkhāras that will produce suffering in the future, darkness in the future. This is what we learn from Vipassana. Attā hi attano nātho, attā hi attano gati. One is the master of one’s own future. The present is nothing but the child of the past. Whatever you have done in the past is done. But you are the master of the present. Try not to generate a single saṅkhāra that will bring misery for you. The future is the child of the present. Be master of the present. Let your present be full of Dhamma. Then, the future will automatically be full of happiness. There will be no darkness in the future. Develop this mastery of the present moment. This is Vipassana. Understand the technique properly and get established in the technique. You have to be aware of the sensations and be equanimous to the sensation. Leave the rest to Dhamma. The results are bound to be good. Keep growing in Dhamma, keep growing in Dhamma. Dhamma is so great, so wonderful. May you all get the best fruits of Dhamma! May you all enjoy real happiness, real peace, real harmony! Bhavatu sabba maṅgalaṃ—May all beings be happy!